Swa, for the first time, appeared officially in a tournament across the border. Swa worked hard to make this happen, the Phnom Penh Post even wrote an article about it. 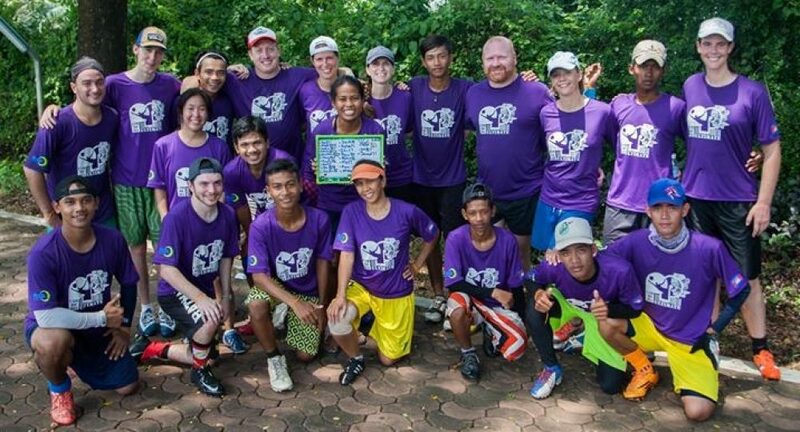 At the tournament the boys of Swa were assisted by Assistant Coach Jared, and PPUA’s own Lanie and Romina, as well as three additional ‘floating’ women; Joanne, Asha, Jamie. Zone cup boasted teams such as Shiok (who came tenth in World Club Championships in 2014), so the competition was bound to be tough. Yet, Swa worked hard and played incredible last weekend. Swa was seeded in the bottom bracket, but that still had very strong teams: Chuckies, Freakshow, Expendables, and Baymax. The first international game for many of the Swa players came with the necessary nervousness. However, Swa had been practicing a zone defence with a four-man cup, which worked well and seemed to throw off Freakshow for the first few points. There is no shame in losing against such an experienced team and Swa fought well. Swa took the early lead, bringing it up to 3-1. Chuckie then fought back hard and took the score to 7-4 in their favour. Swa didn’t give up (“Su Su SU!” was heard from the sideline regularly) and Swa scored three times in a row, scoring the 7-7 just after soft-cap was called. Chuckie scored the next and then were about to finish it. They were so close to the endzone that some of their players on the sideline were already high fiving. Out of no-where Jared came a-flyin’ and made a huge lay-out D. Swa was back in the game! Calm and composed Swa brought it back up to make it 8-8. In addition to the loss, we had some serious bad news. Jamie, who could not make the first game, arrived but got bumped into in her second point and got seriously injured. While she kept good humour, it was very sad for Swa to lose such an experienced player. I think I speak for all of Swa (nay, for all of PPUA) when I say that I hope she recovers well! This also meant that Swa was left with only one female sub for the rest of the tournament. This game started as a hucking contest; both teams had a few good huckers and some tall and/or fast receivers. The zone seemed to work well against the expendables, forcing them to throw hammers and I/O’s before the inevitable huck. After ten points Swa was leading 6-4. However, the heat and hard work took its toll. Dyno, Reach, and Heng all suffered from cramp and had to take injury subs. Expendables took the lead (at 8-9) just after soft cap was called.Swa didn’t manage to recover from this blow. This team was a familiar one for Swa; it was HHH with some extra players. However, at least 4 Swa players at this point suffered from cramps so bad that they couldn’t play. Everyone was clearly exhausted and Baymax took an easy victory. Ending last in their bracket, this meant Swa would have to play a very strong team the next morning (at 7.20 am!) in order to reach the quarter finals. After a gala dinner, Swa retired for some well-deserved rest. It may sound weird, but the score didn’t quite reflect the game. Swa played alright against Shiok, but this is simply one of the best teams in the world. Expendables was a team of floating players. As any floating player knows, it always takes a few games to get used to each other. It was clear that Expendables played a lot better than the day before. However, Swa coveted revenge and fought like lions. More bananas and water may have been consumed to prevent cramps. Points were traded the first half, but then Swa took the lead and didn’t give it away anymore. During the game against the Expendables, Joanne got injured in a similar fashion as Jamie (a collision). She remained near the field to give Swa moral support, but sadly couldn’t play anymore. Luckily, Expendables were kind enough to let Swa play with 2 women in the field. Let’s hope Joanne has a speedy recovery from her injury! Swa did well, but sadly lost. This means Swa came 12th in the tournament. The final was between Whisby Nation (from Taipei) and Mulatto (Philippines), with Mulatto winning 9 -14.